Ken Burnett - The Bata shoes story. Is the glass half full, or half empty? Is the glass half full, or half empty? It depends on how good you are at looking. • Doing the right thing by donors. • Pure gold: the 34 essential foundations of fundraising. • Continous donor choice: fundraising’s best opportunity in ages. 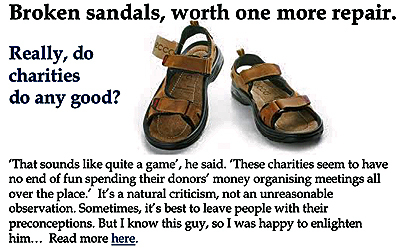 • Giving donors choices: a fundraising preference service from 1986. • Who’d want to live next door to a lapsed donor? The Bata shoes story has been a favourite of mine for so long I’ve almost forgotten why. Recently I had a salutary reminder of it, which made me think that this story perhaps holds one of the simplest yet most profound and important messages of all, for all of us. When I first visited Africa in 1978 I toured the wild north of Kenya. In tiny villages and markets along the way I kept seeing signs for Bata, the shoe company. When it came to indications of commercial product dominance in these flyblown, out of the way spots, Bata was in evidence far more than any other maker of anything. I vaguely wondered why at the time, and later was told this tale, in explanation. 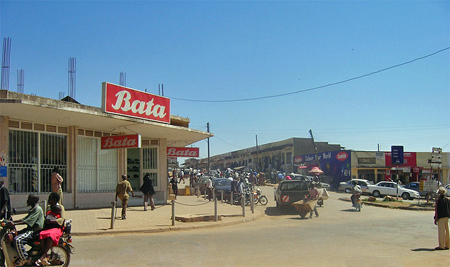 And that’s why signs promoting Bata appear all over Africa, even in the remotest of spots. It’s why Bata’s shoes are known as the shoes of Africa. So, what’s this got to do with fundraisers? Well, it’s about how we look at things and how we see them. It illustrates why being good at looking is a quality well worth cultivating. Another instructive example for me came years back when I found myself at a fundraising conference in the UK, attending a session called ‘frontiers of direct mail’ or something similar, a panel discussion featuring many of Britain’s most successful fundraising direct marketers. Sitting next to me in the audience was a young account manager from a marketing agency of my acquaintance, just a few weeks into the job. After the presentations she couldn’t wait to deliver her verdict. ‘Well,’ I replied, trying to be sagelike, ‘I know what you mean, but funnily enough I took six pages of notes, nevertheless. The fact that people see things differently was brought home again for me recently at the UK Institute of Fundraising’s 2011 National Convention where I shared the stage briefly with two splendid observers of the human condition, Giles Pegram and Alan Clayton. Afterwards we were duly sent the audiences’ evaluations of our presentation, handed in as they always are at the end of our show. I’m a bit long in the tooth now to pay much store by evaluations. They always only give part of the story and you invariably have to discount the ‘Mr Grumpy’ effect. But how can one reconcile the difference between comments such as these? One delegate wrote, ‘didn’t take anything away from session. Boring, not interactive’, while another said, ‘wow – thank you so much. Already I feel 10 feet tall and I haven’t even started yet.’ Were these people in the same room? Well of course they were. Each had seen and heard the same things, but had looked and listened differently. Someone else said, ‘it’s just common sense’, and that was clearly a criticism. Another said ‘it’s just common sense’ and meant it was great to be reminded of simple, fundamental truths. Of course we know nothing anyone does will please everyone. But equally, if we dismiss something because we think we already know better, we’ll often miss out. Instead, we should learn to look and listen better, and to think before we jump. Thanks for the lesson, Bata. 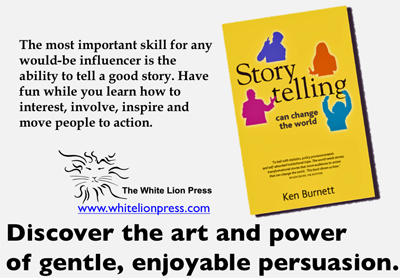 Ken Burnett is a director of The White Lion Press Limited and a former chairman of the board of trustees at the international development charity ActionAid. He’s author of several books including Relationship Fundraising and The Zen of Fundraising and is managing trustee of SOFII, The Showcase of Fundraising Innovation and Inspiration. For more on Ken’s books please click here. From Kevin Baughen – exploitation. I worked for Bata in Europe for years and to be honest, their philanthropic behaviours ended towards the end of the sixties in this territory. From then onwards, Africa and Asia for that matter were markets to be exploited (and I mean exploited) from a manufacturing and supply perspective. Local relations got so bad that I remember during the eighties the MD of Bata Africa had to be rescued by a helicopter from a murderous mob in Kenya keen on showing him exactly what they thought of the working conditions and retail prices... Whilst this doesn’t change the facts of your analogy, I just thought you’d like to know a little more about the company’s record. Kevin Baughen, Bottom Line Ideas. From Ian Clark – alternative version. From Nick Hay – the dark side. Regarding seeing opportunities, there's a funny story in the Vance Packard ‘Waste Makers’ book about a company that figured out they made enough potato peelers in a year to put two in every house in the US. They wondered why that was and found out that people were peeling their potatoes and throwing the peeler away in the newspaper afterwards. A bright young guy suggested they make the peelers with red handles so people didn't throw them away. But his boss decided to make them with brown handles to match the peelings so people threw them away more often and sales went up five-fold. Same ingenuity, but dark side. The shoes of Africa. Wherever you go you see the Bata sign. 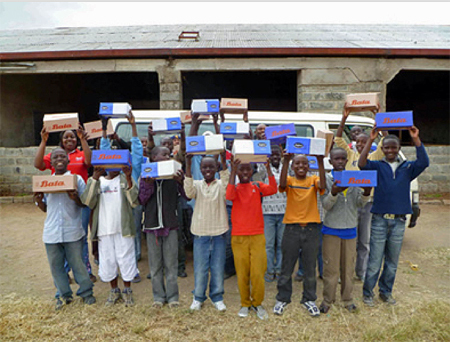 These boys couldn’t hide their joy when they received a new pair of shoes each. ‘Long live Bata’ they all shouted. invariably have to discount the ‘Mr Grumpy’ effect. now to Ken and we'll put them directly on the site. the header. You can opt out at any time.